“In a powerful and inspiring spiritual guide, Thom Rock offers journeys to a more profound life that will resonate with both the initiated and the skeptics. This is a book for individuals, friends, and communities hoping for sparks to greater intensity and joy in their lives.” —Dr. Susannah Heschel, Eli Black Professor of Jewish Studies, Dartmouth College and author of, among other titles, Abraham Geiger and the Jewish Jesus, and Abraham Joshua Heschel: Essential Writings. Now available online or at a bookstore near you! A new collection of meditations on the theme of forgiveness by Thom Rock, A Table in the Wilderness: Forty Days of Forgiveness is rooted in the notion of journeying–of setting out each day to discover yet another peak in the mountain range, some new vista along the wide horizon of forgiveness–and draws upon the wisdom of multiple religious traditions as well as non-religious sources in order to gain new perspectives on this long misunderstood subject. Readers are just as likely to encounter Dr. Seuss or Antoine de Saint-Exupéry’s Little Prince as they are to read the words of Sri Ramakrishna or Saint Augustine along the way . . .
“The mountains I see outside my window—those I have climbed sometimes for wild berries, sometimes for solace—rise up from the valley below as certain and reliable as a compass. There’s no avoiding them. I lift my eyes up to their pinnacled summits nearly every day, their hulking silhouettes visible from just about every corner of town. I watch them change color with the seasons. Chartreuse in spring as their blanketing trees unfurl tender new leaves, they will burn scarlet and vermilion by autumn. Summer twilight can paint them an unlikely combination of saffron and indigo. Come November, if snow hasn’t already frosted them crystalline white, they will blow a stormy plum-blue-black. They are a beacon, a symbol of home that I hold to dearly. Yet climb above their tattered tree lines, where the elements ravage their stony granite caps, and there is suddenly less and less to hold onto . . . until there’s nothing left to do but let go. The wind is always hurtling up against those rocky peaks and hiking those final steps is always an exercise in balance and perseverance and in trusting in whatever keeps us from being swept off this earth in the first place: fate, chance, gravity . . . Walking, especially atop mountains, has also become for me a dynamic image of what forgiveness can look like; a lesson in both moving forward and letting go. 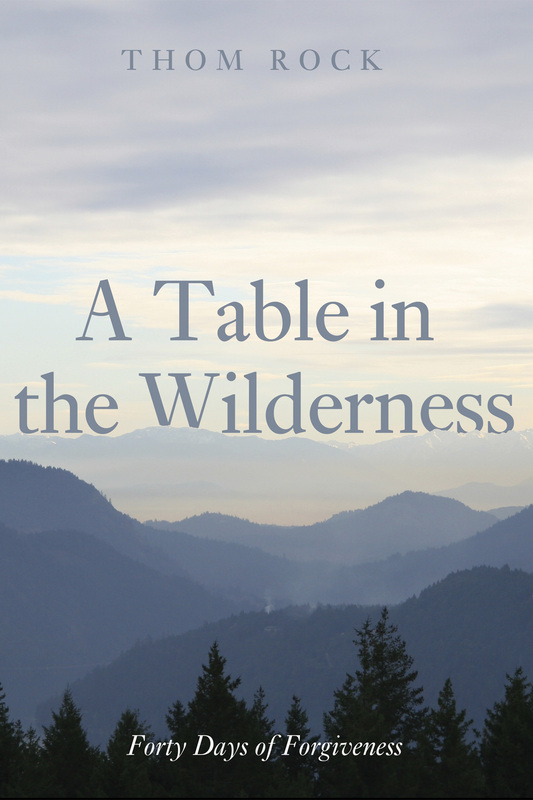 The book’s journey begins and ends with this assertion: not only is there a table of forgiveness set for us in the wilderness of this wild world we live in, there is a seat waiting for each and every one of us at that table. What matters is whether we take that seat (the choice is always ours) and, if so, how we behave at the feast.